Are you looking for the deep cycle batteries? This guide includes some of recommended batteries review. In the following reviews, we look at top batteries for present market. We look at the benefits these batteries and their features. We explain how to compare them to each other, and what you should be looking for when selecting perfect deep cycle battery. We look at the different terms that you need to understand when choosing your batteries. These terms are used by the manufacturers to describe their battery capabilities. With that knowledge in mind, it is very easy to spot the right battery by just looking at its marked features. I prefer to buy from a reputable supply. Deep Cycle Marine Battery, What to Look For? Reserve capacity of 120 minutes. The above battery has a cranking capacity of 870 amperes. This is the ability of the battery to crank your starting motor at 35 degrees Fahrenheit by supplying 870A for 30 seconds. It has a Cold Cranking capacity of 750 Amperes. That means it can crank your motor for 30 seconds while supplying a current of 750A, at a temperature of zero degrees Fahrenheit. It has a nominal voltage of 12 Volts. This is the normal operating voltage. It's fully charged voltage without any load connected is 13.1 Volts. This battery is rated with a capacity of 55Ah C/20. That means your equipment can draw a total of 55Ah for 20 straight hours without the voltage dropping below 10.6 volts. 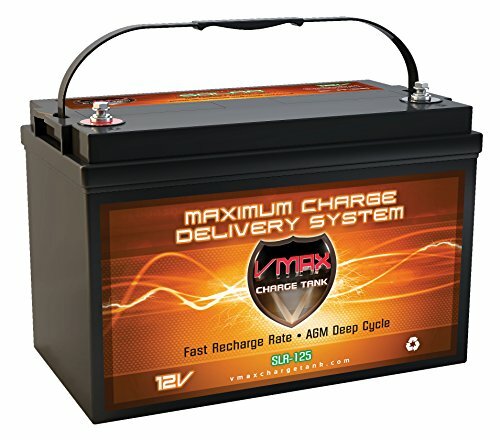 The VMAXTANKS Vmax857 is a deep cycle battery with cold cranking capacity of 300A. It can supply your starting motor with a current of 300 amperes for 30 seconds, at a temperature of zero degrees Fahrenheit before its voltage drops below 10.5 Volts. It can also supply 390 Marine Cranking Amperes. That means you can power your starting motor for 30 seconds at a temperature of 35 degrees Fahrenheit without the battery's voltage dropping below 10.5 volts. It is rated 35AH C/20. Meaning your equipment can draw a total of 35 amperes for 20 hours before you have to recharge it. It has an RC rating of 75 minutes. This battery, when fully charged can supply 35 amperes, for 75 minutes, at a temperature of 80 degrees Fahrenheit before its voltage drops below 10.5 volts. This battery has nominal voltage of 12V. That is the voltage it supplies while powering your equipment. It is rated 85AH C/20. That means your equipment can draw 85 amperes in total for 20 hours from this battery at temperature of 35 degrees Fahrenheit. It has a RC of 160 Minutes. That means you can get a current supply of 25 A for a period of 160 minutes. It has a marine cranking (MCA) rating of 700A. Therefore, this battery can power your cranking motor with 700 A for thirty seconds, before the voltage drops to 7.2 volts, while being operated at 32 ° F. The Hot Cranking Amperes rating is the number of amperes this battery can give when operated at 80 ° F, which this battery is rated at 1380A. You can charge it with 5A to 25A, using a voltage of 14.4 to 14.9 volts. The DCM0035 is a Sealed Lead Acid (AGM) that is capable of being mounted in any position. It is rated 35AH. What that means is that it can supply a current of 35 amperes in total, for period of 20 hours. That translates to about 1.75 amperes per hour before it is drained. The absorbed glass matt keeps the battery well-protected from vibrations and shocks. The battery has the HCPCS CODE E2365 code. That means you can transport by air, sea or land. This battery has a cold cranking capacity of 800 amperes. It can therefore supply your marine motor 800 amperes for 30 seconds before its voltage drops below 10.5 volts at zero degrees Fahrenheit. Its Cranking amperes rate is 1000A. With that voltage, you can power your starting motor with 1000 amperes, for 30 seconds, at 35 degrees Fahrenheit. This battery has a rating of 66AH. With that rating, this battery can supply a total of 66A when current is drawn continuously for 20 hours. That is a current of 3.3 amperes every hour. It has a resee capacity of 140 minutes. That is its capacity to supply a current of 25 amperes for 140 minutes before it is drained. It has an operating voltage of 12 volts while its fully charged voltage is 13.1 volts. Th﻿is﻿﻿ battery﻿﻿ has a rating of 900 CCA. That means it can crank a starting motor with 900 amperes at zero degrees Fahrenheit. It also has a CA rating of 1125A. That means when the temperature is raised to 35 degrees Fahrenheit, the battery will supply 1125A before its voltage drops to below 10.5 Volts. This battery is rated with a capacity of 125Ah for 20 hours; it can supply 6.25 amperes every hour for 20 hours before it is depleted of its charge. It is rated with a reserve capacity of 260 minutes. That is its ability to supply 25 amperes at a temperature of 80 degrees Fahrenheit before its voltage drops below 10.5 volts, for 260 minutes. It total energy rating is 1.7KWH. That is to say, it can supply a total of 1700 watts in an hour before it is totally depleted. Its normal operating voltage is 12 volts while its voltage without any load connected is 13.5 to 13.8 volts. You can charge it with 8 to 35 amperes using a maximum voltage of 14.4 to 14.9 volts. This battery is rated 620 CCA. This cold cranking ampere rating means that this battery can supply a starting motor with 620 amperes for 30 seconds at zero degrees Fahrenheit before its voltage drops below 10.5 volts. It also has a rating of CA 770. So it can supply 770A for 30 seconds at 35 degrees Fahrenheit before the voltage drops below 10.5 volts. It has a capacity of 48Ah. The battery, therefore, can power the onboard equipment for 20 hours while supplying a current of 2.4 amperes every hour. The reserve capacity rating is 98 minutes. If the onboard equipment draws 25 amperes every second, at a temperature of 80 degrees Fahrenheit, it can power it for 98 minutes, before the voltage drops below 10.5V. 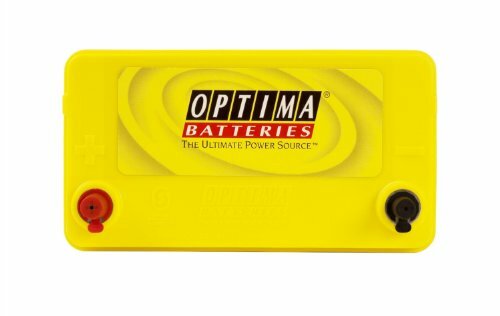 The Optima Batteries 8171-767 (DS46B24R) has a rating of 38 Ah. So it can supply a total of 38 amperes for 20 hours. That comes to about 1.9 amperes every hour it is powering your equipment. It has a reserve capacity of 66 minutes (RC 66). If your marine trolling motor is drawing 25 amperes at 80 degrees Fahrenheit, it can be powered for 66 minutes before the battery voltage drops below 10.5 volts. It operates with a voltage of 12 volts but when fully charged without connecting it to any load, it will measure 13.1 volts. The internal resistance is 0.0046 ohms. That means it cells resist the flow of current with a resistance of 0.0046 ohms. This battery an operating voltage of 12 volts while when it is not connected to any load, it will give a reading of 13.5 to 13.8 volts. It is rated with a 20 hour capacity of 155Ah. That is to say, it can supply a load of 155 amperes within a span of 20 hours. That translates to about 7.725 amperes every hour. It has a reserve capacity of 350 minutes. It therefore can power equipment for 350 minutes, while supplying a current of 25 amperes, at a temperature of 80 degrees Fahrenheit before it is depleted of its charge. It has a total energy capacity of 2.1KWH. Which simply means you can store a total of 2100W, which can be supplied continuously for one full hour before the battery is depleted. 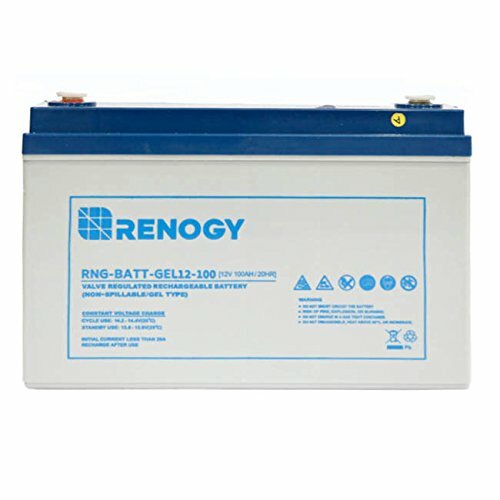 Renogy Deep 12V 100Ah Cycle is a part of the pure GL Deep Cycle Battery DG series that is pure GL batteries. High purity lead, strong grid, and patented gases can be performed electrolyte, DG series provides excellent recovery after deep discharge under the use of dense rolling discharge, and can supply 1000 cycles at 50% DOD. The perfect addition to your solar power system is the 12V 100Ah Renogy Deep Cycle Pure GEL Battery. Individual sources are used in the lead paste of positive post and the battery can recharge easily at a normal level. It is used in special conductive electrolytes so that all parts of the plate are reacted equally, not flowing, lakes or stratification so that it is a gelatin firmness. Heavy duty lead-calcium grid ensures light erosion and enables optimal float charge conditions and a long designed service life of using standby 10-year standby at the optimum operating temperature of 25 ℃. Due to the use of lead-calcium grid alloy, there is low self-discharge and reliable efficacy in the Renogy batteries. At the temperature of the room, Renogy batteries self-discharge ratio per month is about 3% of battery capacity. The construction of the internal battery is designed to withstand fire, the sparkles approach and radios are equipped with battery explosion-proof safety valves to prevent the production of swamp gas. No noticeable cons are available. Front access telecom deep cycle AGM battery providing 12V 100 Amp FT12 100Ah with button style terminals. This battery are made with high quality materials. For firefighting equipment, emergency lighting system, alarm system, standby power supply and telephone switching system, electric wheel chairs telecommunication System, solar system, DC power system, uninterrupted power supply, computer standby power supply system, etc. A non-conductive ABS plastic, shock is made from battery resistant, vibration, chemical, weather and heat battery cases. No need to maintenance and very easy to install. Each battery is strictly controlled, at NNP. 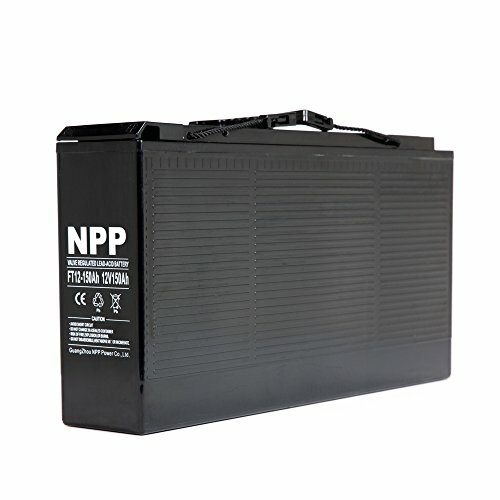 2 years warranty offers each deep cycle battery NPP. You get a chance to replacement offer. So, for 2 years kill your tension and feel flexible with this battery. Strong resistance to shock, vibration, chemicals, weather and Heat. When it comes to selecting the best deep cycle marine battery, we go through several battery reviews. We also check the individual manufacturer’s website for facts about their batteries. We then check their BCI rating. This is the standard rating given by the Battery Council Organization to be used as a common reference when rating the capacity of a battery. The common reference rating that a good battery should have is the RC. This is the 25 ampere current that a battery is able to supply at a temperature of 80 degrees Fahrenheit, for a certain number of minutes before its voltage drops below 10.5 volts. Other common rating used to rank batteries is the CCA. The Cold Cranking Amperes is the amount of current a battery can supply at zero degrees Fahrenheit for 30 seconds before its voltage drops below 10.5 volts. This rating is crucial when choosing starting battery to be used during cold starting conditions. When the starting temperatures rise to 35 degrees Fahrenheit, the rating we use is the CA. This tells us about the amount of current the battery will supply for 30 seconds to a cranking motor before the voltage drops below 10.5 volts. If you are about to buy a deep cycle marine battery, you may be wondering why not buy a starting battery and use it as a deep cycle battery. After all, they’re able to supply a huge amount of current within a short period of time. The main advantage of a deep cycle battery is its capacity to supply current of about 25 amperes for long periods of time before being depleted. The typical period is from 150 minutes to about 350 minutes. If you are using your trolling motor and you are able to run it for that long, which is about 5 and half hours maximum, then it’s a great choice by any standards. If you are using the deep cycle battery to power your on-board equipment or boat, an RC capacity of 300 minutes for example is excellent. You will be able to finish your tasks before you recharge your battery. These deep cycle batteries also feature the capability to drain up to 45% of their total capacity without damage to their cells. Starting batteries on the other hand will be damaged if you drain them to that level. The deep cycle batteries allow for faster charging too after being drained up to 55% of their capacity. When buying the deep cycle marine battery, it’s CCA rating that is crucial. That is because you most likely may use it to start your engine. The same goes for your marine boat. You may need it to start your engine if it is a big boat with a diesel engine. This rating is most important if you will be cranking your engine when the temperatures around are close to zero or zero. When choosing the perfect deep cycle battery, its RC rating is important as the battery itself. This rating tells helps you to compare the batteries and settle on the one that will power your equipment at 25A for the longest time. This rating is taken when the batter is operating at 80 degrees Fahrenheit. It is worth noting that batteries function well at higher temperatures than close to zero degrees Fahrenheit. 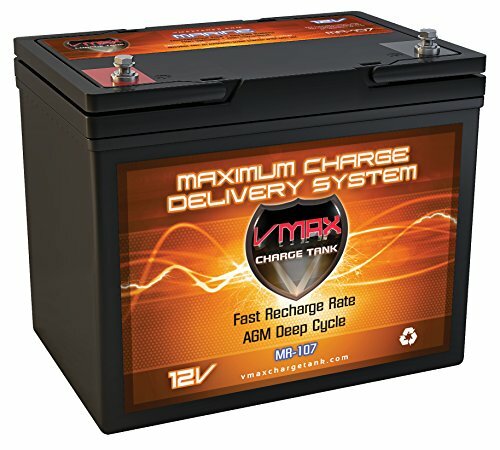 This feature is important when choosing the best deep cycle battery. The weight of a battery is important if you are looking for the best deep battery. This is because the weight of the battery will also be a load that consumes a portion of its electrical energy. If two batteries have the same ratings, then we find that one weighs less than the other, will choose the lighter battery because it will be more efficient in running our marine boat. This is true for those boats that are powered by electric motors. If the boat is powered by a diesel engine, then its weight will still be important but not as much as if the boat depended on the battery’s electrical power for propulsion. You also want a battery that is compact enough. That will give you an easy time when arranging your battery bank. 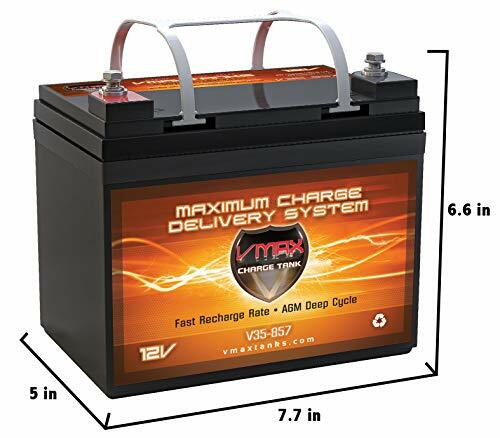 That is why we take size into consideration when choosing the deep cycle battery. Some of deep cycle batteries are AGM batteries. If you read many AGM deep cycle battery reviews, you will learn that these batteries are great at resisting shocks. Therefore, this is a factor that we take into consideration when selecting the good marine batteries. The AGM structure is the best when dealing with vibrations and shocks. If you have a marine boat, this is something that you should consider. Batteries that will not resist vibrations and shocks will perform poorly during certain operations like in extreme weather conditions. Each battery has a specific number of times that it can undergo complete discharge and recharge cycles. 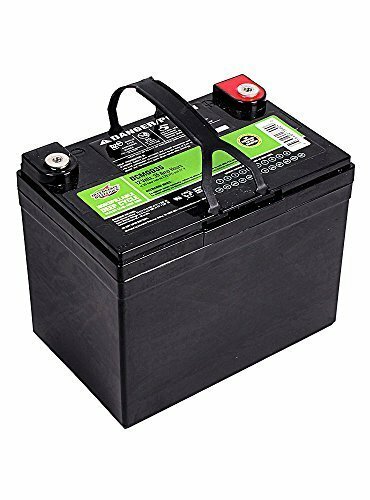 Most lead acid batteries that are not sealed will begin to sulfate immediately they are discharged if recharging is not done immediately. We therefore consider batteries that are made of AGM better than wet lead-acid batteries. What is most important is also the ability of the battery to discharge deeply without its lifecycle being shortened. If the battery does not need to be recharged immediately it is discharged, then we rank it among the best deep cycle batteries. Why? Because is lifecycle will not be shortened when you use it for prolonged periods before recharging. This battery has impressive ratings in terms of its cranking amperes and cold cranking amperes. Rated with a CCA of 750A and a CA rating of 850A, you are guaranteed to start your powerful motor safely and fast. It is capable of supplying 55A over a period of 20 hours. That is great for any small marine boat. For its price, it is a great battery. It also operates at a voltage of 12 volts. That means you do not need any special equipment to power most onboard electronics. 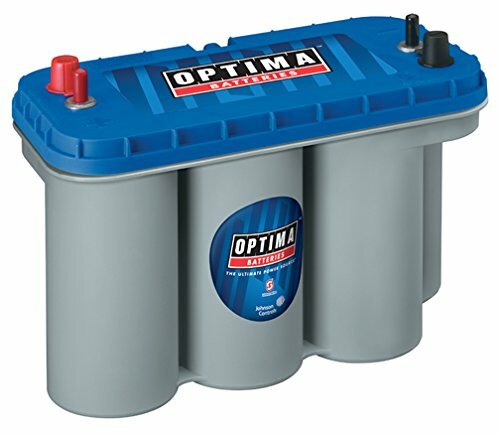 This battery therefore makes it to our top five best and marine deep cycle battery reviews. This battery scores highly when it comes to resisting vibrations and shocks. 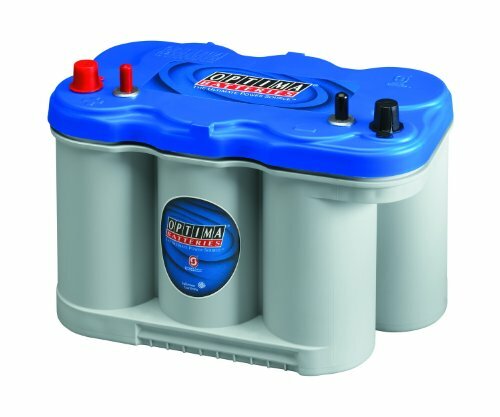 If you are looking to do any rough riding, then this battery is one of the best for your boat. The absorbed glass matt also makes sure the plates are covered by the electrolyte, making it highly efficient during operation. 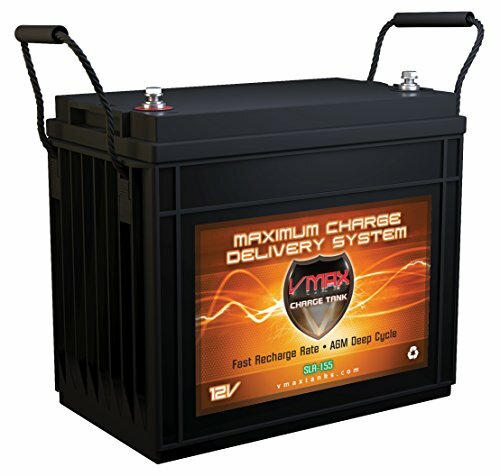 It is also a deep cycle battery which makes it great for prolonged use without fear of damaging its cells. It can supply a current of 35 amperes in total when powering your equipment for a period of 20 hours. If you have radio equipment, this is one of the best batteries you can have. It therefore makes it to the top five of the best deep cycle marine batteries. This Vmaxtanks MR107 12V 85AH Marine AGM is sealed and structurally strengthened to resist extreme vibrations and shocks. It can supply current of 85A for a period of 20 hours. It has an impressive cranking rating of 700A for operations such as starting your motor at 35 degrees Fahrenheit. One of its amazing features is its ability to give 1380A when operated at a temperature of 80 degrees Fahrenheit, without the voltage dropping below 10.5 volts. Those impressive features make this one of the best deep cycle battery for trolling motor and starting motor. This is also an Absorbed Glass Matt battery. The AGM structure ensures that this battery resists any vibration and shocks, giving your electronic equipment the same supply of current as if the boat is help rock solid while powering them. If you have never exposed you wet lead-acid battery to vibration when operating it at its maximum capacity, you might not appreciate this feature enough. This battery can be transported by air, land, or sea. You can therefore get it fast if you are in urgent need of a battery replacement. It therefore makes it to the top of the best five marine batteries. 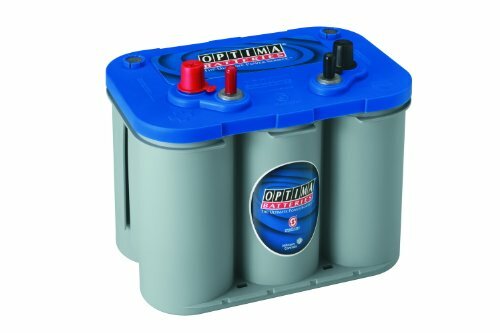 If you are looking for a dual purpose battery, this is the best selection for your marine boat or trolling motor. It vital features are very impressive. It has a CA rating of 1000A and CCA of 800A. You can therefore rest in peace know your big starter motor will have enough electrical power when you need it to start your engine. With a Capacity of 66Ah, your onboard equipment will be well supplied with a current of 3.3 amperes for 20 hours! On top of that it has a reserve capacity of 140 minutes. That is over to two hours of continuous power supply for your trolling motor or heavy marine boat electrical equipment. 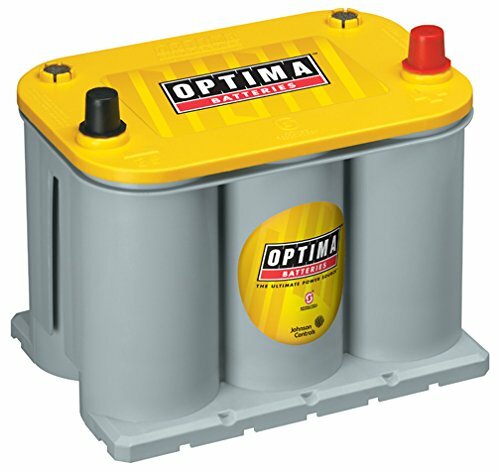 This battery concludes the list of our best top five best deep cycle batteries. The above comprehensive the best deep cycle battery will guide you when choosing your marine battery or battery without being lost in the technical terms. We have looked at the most important features which you can use to quickly make up your mind at a glance. Choosing the best battery for your boats should not be a headache anymore. Neither do you need to do any trial and error. Just keep the desired CCA, CA, RC, and AH ratings in mind. Those ratings combines with AGM vibration resistance structure should guide you in making the best choice.